"CHANDNI Chowk" or "Gausia" is a place that no woman in our country can do without. You might have access to the best designers in Bangladesh or even in the world and yet "Gausia" will occupy a special place in your heart. Have you ever wondered, though, what it is about "Gausia" and Chandni Chowk" that attracts women like honey to bees? One reason may be that it lets you shop with abandon. In the closed atmosphere of a boutique you can only do so much of browsing but the open space in "Gausia" gives you the thrill of the "hunt" ...the pleasure to look around and then decide. Also, you don't have to be "prim and proper" when you are here and you can shop in your most comfortable dress and haggle to your heart's content. For people who keep an interested eye on fashion, Gausia and Chandni Chowk is a Godsend. Where else would you find such mind-boggling variety of outfits, dress materials and accessories? I cannot imagine Chandni Chowk without the roadside shops and ferrywallahs. They add a lot to the spirit of these places by their constant chants such as " Ja niben tai dosh taka" or with their noisy arguments with the customers regarding price or quality. Before entering the main gate of Chandni Chowk on your left hand is the hub of roadside shops. These shopkeepers are always on the go and ready to prey on a customer. They sell kameezes, towels, bags and other products at prices that will surprise you, and yet of course you will haggle and get a better bargain. If you go a bit further ahead and towards the left, then in Gausia you will find a large number of aggressive but mostly friendly ferrywallahs. Their wares are worth taking a look at, especially their bangles and clips. You can get earrings and a necklace for as low as Tk. 10 or a funky ring for Tk.5 or three dozens bangles for Tk.20. Now, can you beat that? Chandni Chowk is the place in town, which brings you the greatest variety of fabrics. Whether you want taat, georgette, silk, cotton, crepe or chignon or a mixture of two fabrics you can get it all here. When you enter the main gate of Chandni Chowk, on the right side are stores for fabrics and dress materials. Three-piece materials are very popular now as you do not have to go through the hassle of buying dupatta and salwar material separately. A great collection of local and imported fabrics is found here. The drawback of the ground floor is that the lanes are very narrow and there are many beggars who are likely interrupt your search for the right fabric with their constant demands for alms. That is why the first floor is more comfortable as it is air conditioned and spacious. This place is a regular haunt of boutique owners and designers and this is the place from where they derive their raw materials and then transform them to trendy dresses which you are willing to spend a bomb on! You can get a good cotton three-piece for Tk.300 and georgette one for Tk.1200. People who like customised salwar kameezes usually buy fabrics in yards and then mix and match according to their design. Almost all shops have a wide assortment of fabrics but do check out Sheetal Fabrics and the Pride Showroom and Dandy Dyeing showroom. On the ground floor there are jewellery shops also shops that specialise in silver jewellery. The famous Monihar Jewellers and The Pearl House (one of the branches) are located here. Rajdhani Shoes on the farthest right-hand corner of Chandni Chowk has a decent range of flat shoes at very reasonable prices. "Bionic shoes" also has some nice flat sandals. If you are a bangles buff then do not miss the second floor of Chandni Chowk as they have lovely high quality glass bangles. They also have chach bangles, which is a special kind of plastic and has a good finish. Teenagers will love them. Check out Poly Cosmetics for glass and imitation bangles. When you enter the Gausia side there, are a large number of cosmetics and jewellery stores. Interesting is the assortment of deshi cosmetics you can find at these stores such as Cute and Meril products. Devdas copper bangles are available for Tk. 200 a pair and set of copper churis will be 300-ish. Also have a look at Citi Gold bangles, which looks like gold and feels heavy too. Bindi or "tip" adds glamour to our look and women are constantly in search of new designs. This is found galore in the ground floor in "Gausia". Laces, beads and sequins: the three things that can transform a drab outfit into an elegant one. The first floor of Gausia can be called the 'lace kingdom'. Most of the shops in this floor specialise in laces, sequins, beads, saree borders and "jhumkis". On the ground floor there is only one lace shop called A.K. Traders. It is the oldest and one of the most well known lace shops in Gausia. There are quite a few shops in this floor, which sell threads of all colours for embroidery. I feel that this is one of the most intriguing places in the whole of Gausia and Chandni Chowk. For creative souls this is the treasure-trove of materials and accessories with which they can whip up a really stylish dress. 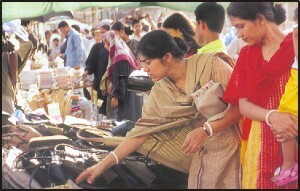 The wholesale kameez market is found in the second floor of Gausia and you should make it a point to explore this place. Traditional kameezes and trendy shorter kameezes are found at reasonable prices. In the ground floor also there are some stores, which sell kameezes, and Dhaka Fashion House here has good salwar kameez sets for adults and children at great prices. Amid hectic shopping and bargaining, snacking in Gausia is fun and Magnolia Fast Food is one of the places where you can gorge on patties, samosas or cream rolls. The lassi is awesome. There are other shops where you can have mouth-watering phuchkas. Apart from excellent variety and prices Chandni Chowk and Gausia has a special flavour, which no shopping complex can match. It is a woman's favourite haunt.